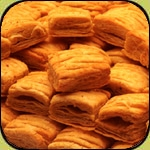 whole flour mix and give us healthy and tasty snack. also like with tea and coffee. Mix flour, rice, flour, wheat flour and plain water, ghee, salt and red chili powder. Make dough, as the average size balls and roll in circle, The shape. Cut long slices and make 3 or 4 times each slice. deep fry do all these pieces in oil. Make sugar powder and sprinkle it on these cookies. can u please explain how to use the cut strips and shape them so it looks like biscuit.thanks. How do you get the layers?